An Australian red ensign, with Union Jack and stars printed onto the surface. The flag has two embroidered panels on front. 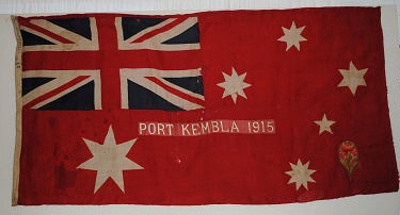 The central panel has the words "PORT KEMBLA 1915" embroidered onto it. The other panel is located on the lower right hand corner, and has an embroidered waratah on it. There is a white strip of fabric along the left hand side, with the words "2 YD. FEDERATION" printed onto it. This flag was presented to Captain Blow, the organiser of the Waratah recruiting march, when this march passed through Port Kembla. Flag itself possibly made by government printers, but at this point unknown.